See, I’m an old military man. If you were too, you’d know what the old military slang for the local jail was…. Luckily, I’m not in jail. But I am going to be in the glasshouse, very soon. 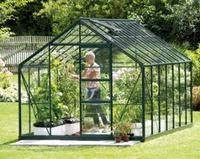 I’ve bought a greenhouse. Getting to this point has not been easy. Let me explain. Last year, we had an experimental summer. By we, I mean the long haired and lovely one and myself, which involved me thrashing about in the muddy jungle that we call “the garden”. I was keen on getting my own tobacco, she was determined to grow tomatoes. While I was tilling the sod, I also decided to plant some old potatoes that had grown shoots while they were hiding in the kitchen cupboard and since the other one likes herbs and stuff, we planted some of them as well. The tobacco, herbs and spuds all did very well. The tomatoes didn’t. Nor did her pepper plants. We need a greenhouse, she said, then we can grow tomatoes and such. If she says so, then it’s a done deal. Put one greenhouse on the list and clear the decks. Clearing the decks, as it goes, wasn’t ever going to be a doddle. After having dug up half the lawn to make room for all the stuff we want to grow this year, the only space left for a greenhouse was occupied by a huge old poplar tree which had grown to a staggering height and had about six trunks growing from a huge root. Add to that a couple of old bushes of no particular sort (I have no idea what they were!) and a good covering of ivy and brambles. All that had to go. It took me some weeks, working in short but effective bursts. The bushes went quite quickly. Dig around them, cut the main roots and heave. I had to cut the stems and branches to get the rubbish into the back of the estate car but after a few trips to the rubbish dump recycling centre, I had some space to drop the big old tree. My old chain saw was worn out. 20 years of cutting wood has taken its toll on the old Black and Decker. So, off to the hardware store and buy a new one. I did so and began to hack away at the poplar. I had to strip away some of the branches just to get started and already the pile of vegetation was beginning to grow. The trunks are good enough for firewood next year but the branches are just rubbish. I took two afternoons to get the tree down. I took four days to get the rubbish to the aforementioned recycling centre. Wunderbaum can begin to pack their operation up, my car stinks of pine. The naked trunks were reduced to stove sized chunks and I split the larger ones using the tree stump as a chopping block. I will not be digging the stump out this year. It’s too big to contemplate at the moment. I’ll let it die before I get to dig the roots out. I just ache too much to think about it right now. Anyhooo… I’ve finally got the space cleared and the greenhouse is on its way from the supplier. It should be here within days. It’s a good ‘un, as they say where I come from. 11.2 square metres groundplan and an upright height of about five feet. Aluminium and glass. The slanted roof gives a total height of well over two metres. There is room for toms, peppers, cucumbers, aubergines (whatever they are, but the missus says they’re good..!) and anything else I can think of to grow in there. The tobacco went well out in the garden last year despite the constant rain but I may try to start some plants in there before I plant them out. Maybe I can get a head start on the growing season. All that will come later though. I still have to erect the damn crystal palace….